SailingNetworks : Farewell Marina Lanzarote! Home / News / Farewell Marina Lanzarote! The fifth edition of the RORC Transatlantic Race started on schedule at 1200 UTC on Saturday 24 November. 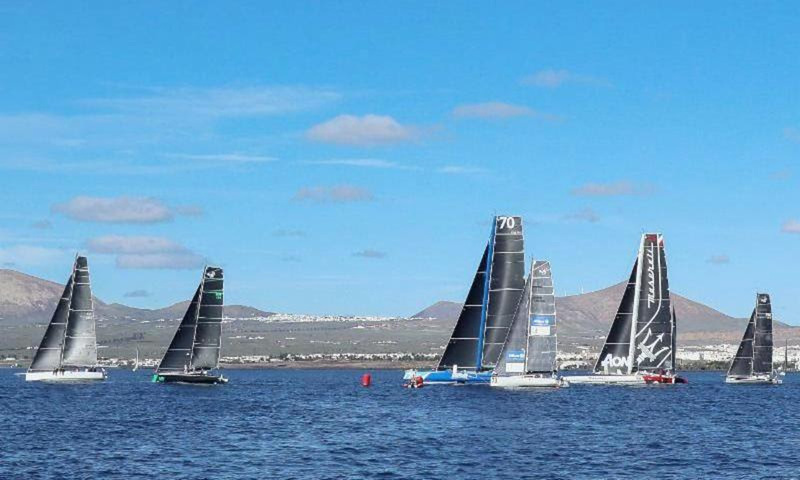 The fleet bid farewell to Marina Lanzarote which had once again provided an ideal location to prepare for the 3,000 nautical mile race to Camper & Nicholsons Port Louis Marina Grenada. "The fleet got away to a clean start," commented RORC Deputy Racing Manager, Tim Thubron. "Kuka3 was first over the line, followed by Class40 Hydra and the two multihulls; PowerPlay and Maserati. My Song held back at the start but was at speed and full upwind mode at the pin, soon leaving the rest of the monohulls in their wind shadow." Franco Niggeler's Swiss Cookson 50 Kuka3 was going well, second on the water in the IRC class behind My Song. Arto Linnervuo's Finnish Xp-44 Xtra Staerk made a cracking start, beating all three Class40s to the turning mark at Puerto Calero. Trevor Middleton's British Sunfast 3600 Black Sheep got away well, the smallest yacht in the race has a crew of five and a massive fan club back home, especially from Yorkshire, Trevor's home county. The amateur crew racing First 47.7 Kali is skippered for the first time by Corinne Wirth. Representing the Swiss Ocean Racing Club, the team are indicative of the ethos of the race. Sail safe and fast! By 1800 UTC on Day One, the duelling multihulls had chosen to sail 30 miles north of the rhumb line. Six hours into the race, Maserati had passed PowerPlay and was one mile ahead of their rivals. My Song was making good speed in the light winds leading the monohull fleet, with Kuka3 six miles astern. Class40s Eärendil and Hydra were side-by-side matched for speed. The entire fleet are heading north above all of the Canary Islands avoiding the wind shadow from the islands. With the ridge of high pressure predicted to provide light winds, the overall strategy for all of the competing yachts will be to stay in the best pressure during the first night. Finnish Xp-44 Xtra Staerk was still ahead of the Class40s at 1800 UTC and skipper Arto Linnervuo commented from on board: "We had light winds at the start and inshore it was very shifty, so we had to concentrate on keeping the right side of that. We have now seen the wind go to the south and increase a little to about 11 knots. The spirit on board is fantastic and we are so happy to start this race. We are living our dream and we have such interesting boats and sailors to compete with. As the sun goes down, we can feel the chill in the air, but we are dreaming of getting south into warm trade winds and what promises to be fantastic sailing conditions."